A view to the famous Fountains of the Bellagio Hotel and Casino in Las Vegas, Nevada. Bellagio is a luxury resort, located in Downtown Las Vegas, opened in 1998. The Fountains are situated in a man-made lake on the place of a former golf course and are a vast choreographed of water, light and music, realized with the help of more than 4,500 lights and a network of pipes with 1,200 nozzles. The performances are changing every 30 minutes in the afternoons and early evenings, and every 15 minutes from 8 pm to midnight. 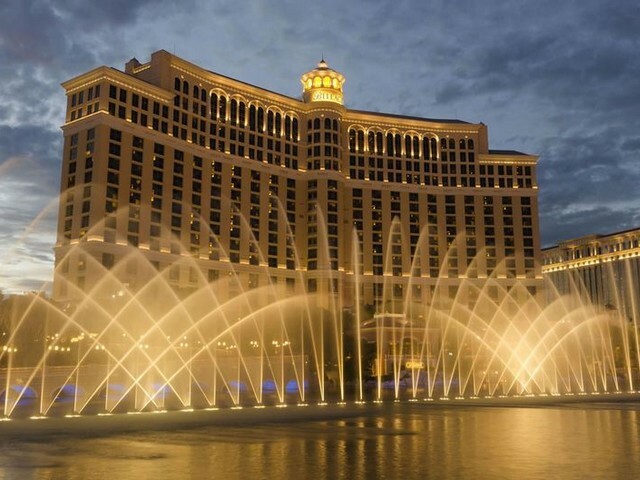 The Bellagio Fountains in Las Vegas cost $40 million and are worthy of every invested penny.